Skin Tags, they can turn up anywhere on your body; your back, on your neck, in your armpits, your face, and even your eyelids. 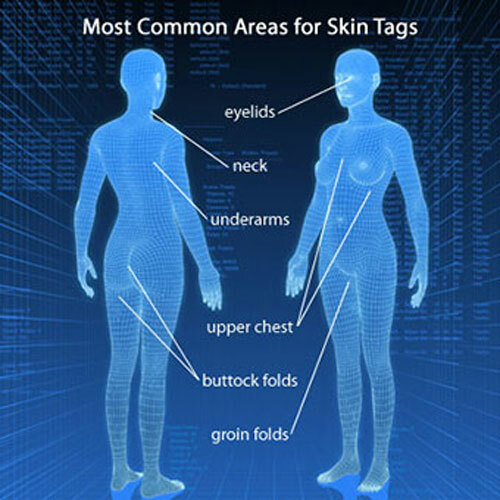 They are called ‘skin tags”, and they are the most common growth on the skin according to MedicineNet . This often small and soft flap of tissue like growths can be annoying to many but are benign and harmless. Almost everyone will at some point in their lives develop a couple or sometimes hundreds of skin tags. They are more common among people with diabetes, who are pregnant due to hormonal changes, as well as people who are overweight or obese. They can also be hereditary . The cause, however, is unknown. But what is the best natural skin tag removal treatments? Freezing: The doctor will apply a small amount of liquid nitrogen on each of the skin tags to remove it. The spot where the skin tag was, will blister for a few days and will heal quickly. Cutting: This is done by using surgical equipment such as sterile scissors or a scalpel. The skin tag is snipped off, and the area may need stitches after the procedure is done depending on how deep the doctor had to cut. Burning: This procedure is done by using a wire that uses an electric current to get it hot. Once the wire becomes hot enough, the doctor will use it to burn off the skin tag at the narrow stem to remove the whole skin tag. Again, the skin tag may blister for a few days and will heal quickly. Ligation: A doctor can also remove a skin tag by cutting the blood circulation to it, causing it to die and fall off. This procedure takes about 7 to 10 days to work; it’s incredibly effective also. Some people would seek to find a more natural way to remove their skin tags and avoid any medical procedure all together going with a less invasive route. They would prefer to use products that can be easily found in their home or local stores. As a remember, always test a small area of your skin first, to make sure that you don’t have any allergic reactions to any of the following products. Apple cider vinegar is one of the most popular and multi-use, natural home remedies. To remove your skin tag, you will need a bottle of apple cider vinegar and a few cotton balls. dry the area around and in the skin tag. Make sure to squeeze out excess vinegar from the cotton ball. With the cotton ball soaked in apple cider vinegar, gently apply to skin tag and then leave it to dry naturally. You will do this procedure three times per day; morning, noon and before bed. You will then notice that after a few days, it should begin to turn brown, the skin tag will have dried up. After about a week or so, the skin tag will have turned black and will eventually fall off. The area will heal and turn back to normal. Using Tea Tree Essential Oil is another popular home remedy that is used to remove skin tags. You will follow the same directions as the Apple Cider Vinegar procedure. Mix 4 to 5 teaspoons of cold water, with 2 to 4 drops of tea tree essential oil, mix them well before applying the solution. Before you start the procedure, it’s important to make sure that you are thoroughly clean and dry the area around and in the skin tag. Soak a cotton ball in the Tea Tree Oil solution. Make sure to squeeze out the excess Tea Tree Oil solution from the cotton ball. With the cotton ball soaked in the Tea Tree Oil solution, massage gently in a circular motion for about 3 – 5 minutes, then leave it to dry naturally. For the best results, you have to repeat this procedure three times per day; morning, noon and before bed. It can take about a month to vanish your skin tag completely. If irritation occurs on your skin when you are using it with water, you can dilute the Tea Tree oil with a carrier oil like olive oil or coconut oil. This prevents the solution from being too strong. This combination has been found to be very effective because castor oil and baking soda work together to alter the PH balance of the skin tag, resulting in the removal of the tag. Mix 1 teaspoon of Baking Soda, with 1.5 teaspoons of castor oil, mix them well to make a smooth paste. Apply the paste onto the skin tag and make sure that you focus on the stalk part of the skin tag. It’s a good idea at this point to place a bandage onto the treated area to prevent the paste from coming off. A few hours later, rinse the area with lukewarm water. It can take about 10 to 15 days to vanish your skin tag completely. Both lemon Juice and Aloe Vera Juice, can both be used separately for a natural treatment of skin tags. Especially, if you don’t have any of the other products in the above methods, available in your home and need something quick and easy. They are not as strong as the other methods, but they can be just as effective. The same procedure is done with the lemon juice and Aloe Vera juice as the others. Soak a cotton ball in the Lemon Juice. Make sure to squeeze out excess juice from the cotton ball. With the cotton ball soaked in lemon Juice, gently apply to skin tag and then leave it to dry naturally. 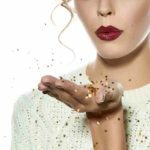 Having skin tags can be depressing to some and perhaps disgusting to others, but the good news, is the knowledge that there are options to permanently remove them, either medically at the doctor’s office or natural remedy, right in your own home, gives you the assurance that you don’t have to live with skin tags for the rest of your life.